Today Modiphius have announced the impending release of the John Carter of Mars Core Rulebook in PDF. Their hugely exciting new 2d20 RPG transports you to the dying world of Mars. Full of adventures, heroism and romance on the Red Planet. The John Carter of Mars Core Rulebook is available in PDF on Modiphius.net and DriveThruRPG.com. Here’s further details! 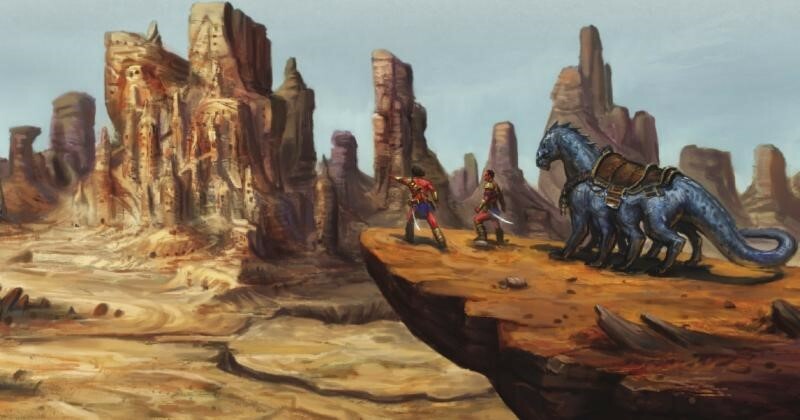 John Carter of Mars: Adventures on the Dying World of Barsoom transports you to the Red Planet of Barsoom. An arid, dying land of ancient civilizations and fearsome creatures. Begin your adventures of romance and heroism using a pulp-action inspired variant of the 2d20 System. Take on the role of heroes as you travel, battle, and romance your way across the wondrously dangerous world of Barsoom. Play as John Carter, Princess Dejah Thoris, the fearsome Thark warrior Tars Tarkas. Or create your own heroes from an exciting variety of options. The book gives an overview of Barsoom and its peoples, a perfect way to introduce new players to the wondrous world of John Carter of Mars. Detailed chapters on Barsoomian technology, creatures and cultures are included. Also featured is a new talent focused, narrative variation of the 2d20 System including a step-by-step character generation system designed to create heroes from a variety of backgrounds and concepts. Create a wide variety of characters such as a Dashing Red Martian Duelist. Alternatively, you could create a brilliant First-Born Scientist, a Savage Beastmaster, even Earthborn characters, allowing players can follow in the bounding footsteps of John Carter himself! A detailed narrator’s section filled with information on how to run genre-and-setting appropriate campaigns. It includes information about the great and terrible secrets of Barsoom. There are also three eras of play based on the adventures of John Carter himself. Adventure during the Dotar Sojat era, or during the time where Carter became a Prince of Helium. In the years after when he was believed dead, or fight alongside Carter and allies during the Jeddak of Jeddaks era. Want to explore this fantastic new RPG setting and want to know more? Check out the John Carter of Mars Collection. There’s a free Quickstart to sample the game, free character sheets and a host of late Kickstarter pledges. You’ll find the John Carter of Mars core book and accessories in retail and Modiphious store in the Spring. The Phantoms of Mars campaign launching in PDF in January.